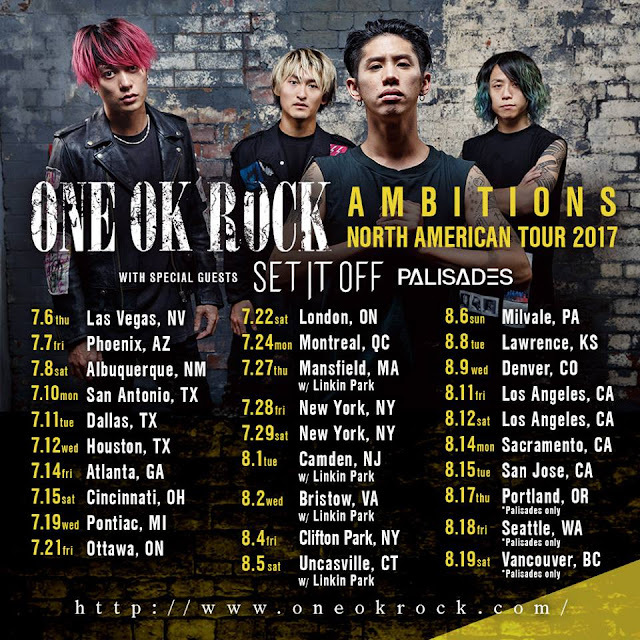 PennsylvAsia: Japanese rock group ONE OK ROCK at Mr. Smalls, August 6. Japanese rock group ONE OK ROCK at Mr. Smalls, August 6. The Japanese rock group ONE OK ROCK will play at Mr. Smalls Theatre in Millvale on August 6 as part of its Ambitions US Tour. The Chicago Tribune profiled the group last year ahead of their Pittsburgh concert. One Ok Rock could easily be mistaken for an American band, which might actually be the point: The group's members love American pop-rock, and the sort of Hot Topic/Good Charlotte/Warped Tour punk that was popular circa 2005. Ask Taka what music he likes, and he'll cite acts such as Linkin Park, Maroon 5 and "a lot of emo stuff." The album "35xxxv" (pronounced "thirty-five") is a crisp, endearing, slightly dated homage to those bands; it sounds like an album of Bush-era Fall Out Boy outtakes. To a small but vocal contingent of its Japanese fans, the band's preoccupation with stateside success was perceived as an abandonment of its roots ("Maybe they understand already?" Moriuchi says hopefully when asked how these fans feel now). Backlash or not, Moriuchi, having lived in southern California, isn't in a hurry to go back home. "The United States is so comfortable for me. I don't know how it is for the others, but for me it's so much better than Japan." Tickets for the all-ages, 7:00 pm show are $25 online. Mr. Smalls Theatre is located at 400 Lincoln Ave. in Millvale (map).